Iran should refrain from meddling in Bahrain’s internal affairs following the signing of a key nuclear deal, said British Ambassador Iain Lindsay. The outgoing diplomat said the UK was aware of the concerns raised by GCC states regarding the deal between Tehran and the P5+1 Group to curb Iran’s nuclear programme, reported the Gulf Daily News (GDN), our sister publication. 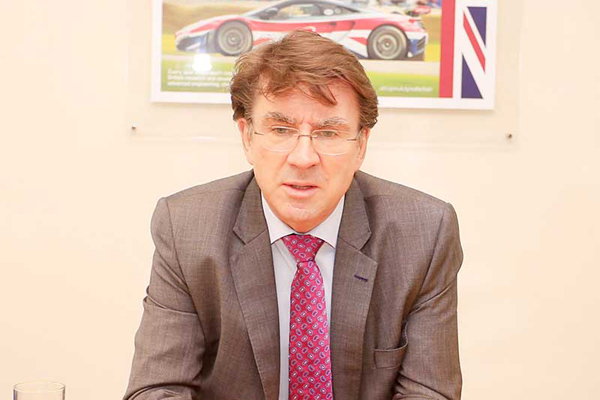 “As UK is a member of the P5+1 Group, it is pleased to reach an agreement with Iran,” he said yesterday during a Press briefing at the British Embassy in Ras Ruman. “We recognise concerns GCC countries have expressed and how Iran behaves in the region. Under an accord reached in Vienna, Iran will stop for at least a decade the majority of its centrifuges used to enrich uranium and sharply reduce its low enriched uranium stockpile in return for sanctions lifted by the US, European Union and the United Nations. “We hope and expect that Iranian behaviour in the region will and should improve following this agreement,” said Lindsay. Meanwhile, Linday highlighted defence and security relations with GCC countries, including the establishment of the first permanent British base, called HMS Juffair, in the region since 1971, which aims to deter regional threats and maintain security in the Gulf and wider region. “Work on that has already started in Mina Salman and should be completed in the second half of next year,” he added. UK Foreign Secretary Phillip Hammond signed a memorandum of understanding with Bahrain’s government in December to set up a permanent naval base here. It is expected to cost £15 million (BD8.6 million/$23.3 million) and accommodate Britain’s new Queen Elizabeth-class aircraft carriers and Type 45 destroyers. The GDN also reported on the opening of the UK Maritime Component Command complex in Juffair last month, which constitutes Britain’s largest maritime forces’ investment on foreign soil. Lindsay said Bahrain was a key member of a global coalition to fight the Islamic State (IS) terror group, which is also known as ISIL and Da’esh. “This fight against extremism is the fight of our generation and requires a long term response,” he said.